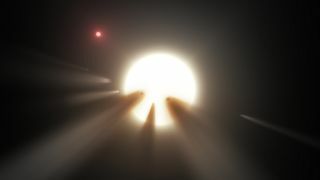 Artist's illustration showing fragments of a shattered comet passing in front of a star, perhaps the best explanation for the mysterious dimming of "Tabby's Star." The mystery of whether a darkening star is home to an alien megastructure might be solved with the aid of crowdfunding, researchers said. Since these events are far too substantial to be caused by planets crossing the star's face, researchers dubbed KIC 8462852 "the most mysterious star in our galaxy." There is still no widely accepted answer as to why Tabby's Star behaves so strangely. "Comets are currently the best natural explanation," Boyajian told Space.com. "That said, 'best' does not necessarily mean 'good.'" Unfortunately, Kepler has moved on to a different mission and can no longer observe KIC 8462852 in an attempt to unlock the star's confounding secrets. "It's exciting when you realize that you are working on something new and unusual, but also, at the same time, extremely frustrating," Boyajian said. To keep working on the mystery of Tabby's Star, and hopefully ease some of that frustration, Boyajian and her colleagues are now turning to crowdfunding. They said they hope a Kickstarter campaign will help raise at least $100,000 by June 17 to secure observing time on a global network of ground-based telescopes. That way, researchers can see when the star's brightness dips again, the investigators said. The scientists are currently observing Tabby's Star using the Las Cumbres Observatory Global Telescope Network (LCOGT), a privately run network specifically designed to continuously monitor objects in space. Although this network does not have Kepler's precision, it will be sensitive enough to detect fluctuations in the star's brightness, researchers said. So far, the network has gifted the researchers with 200 hours to begin the project, which will take them to the end of the summer. The new Kickstarter campaign may help cover the expenses of monitoring this star for a year, including a total of 2 hours per night dedicated to observing the star. The scientists said they are turning to private observatories because government-run sites do not have the capabilities for the long-term, continuous monitoring this project needs. The traditional way to pay for private observatories is through a government grant, but the researchers said that more than five-sixths of grant applications for time on such facilities are turned down. And the proposals that do get accepted are usually relatively "safe" ones that promise certain and immediate returns, the researchers said; that's why the team is now turning to crowdfunding. The researchers warned that patience will likely be needed, even if this project gets funded. When Kepler was observing KIC 8462852, after all, the star fluctuated in brightness only 5 percent of the time, and at unpredictable times. Still, "this project is the ultimate opportunity to help discover something new," Boyajian said.